It all started with a young California artist named John Garcia who saw a video on YouTube about students in Tucson protesting the ending of ethnic studies in their district. John Garcia met muralist John Carlos de Luna a couple of years ago. A friendship developed and John ended up inviting John Carlos de Luna to help paint a mural on a wall a close friend . John was so moved by the book ban in Tucson that, as a personal protest, he ordered all the banned books for himself. They looked through the books and one image of a curandero caught their eyes. The mural took about three weekends. The artists used house paint, spray paint, a projector, and a step ladder. 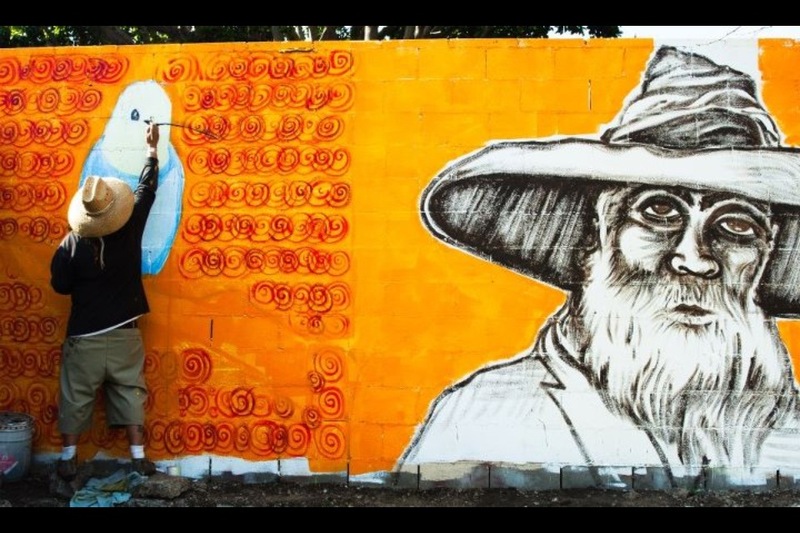 This mural was done without any funding–just two artists reacting to a movement and creating art. 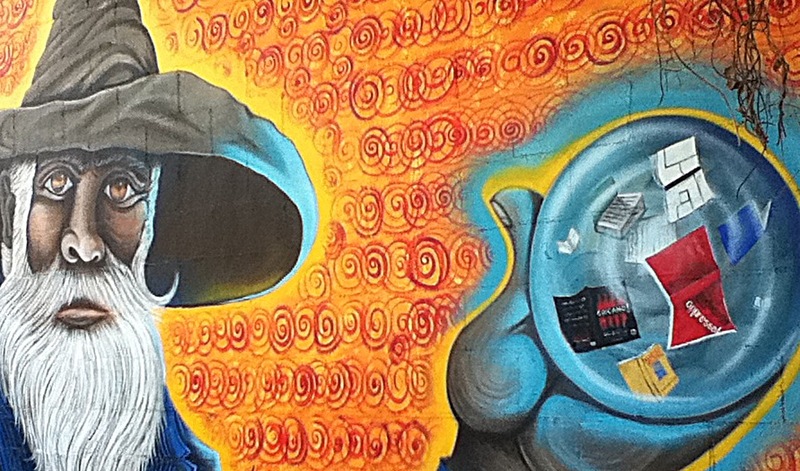 The mural was documented by Randi Bartosiak, a talented young photographer from New York. 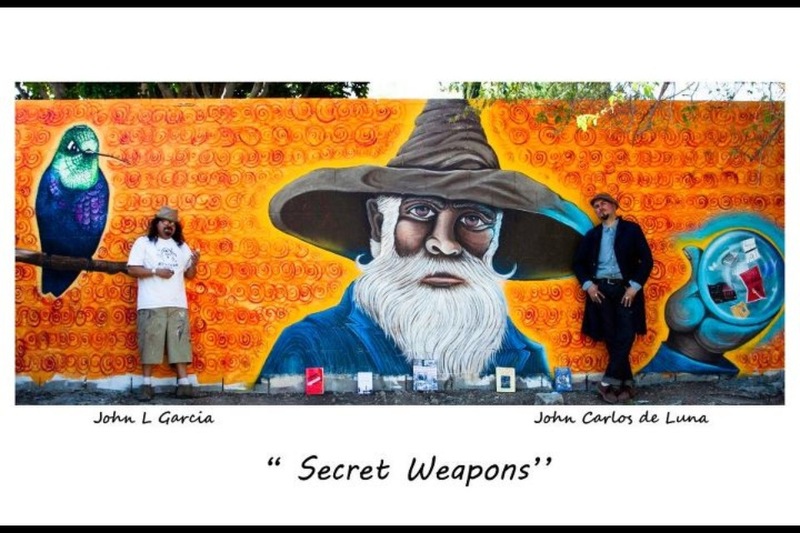 “Secret Weapons” as the mural is entitled, is located in Hollywood, California, on a private wall safe from vandalism. It can be viewed from the Southbound 101 Fwy when approaching Vermont, also from Southbound 101 on-ramp at Melrose. Floating in crystal ball, images include a curandero, a hummingbird-to represent the forces of creation , the Aztec deity Huitizapochtli-who serves as a native spirit guide. The background swirls represent the cosmos, the spiral of life that connects all creation. 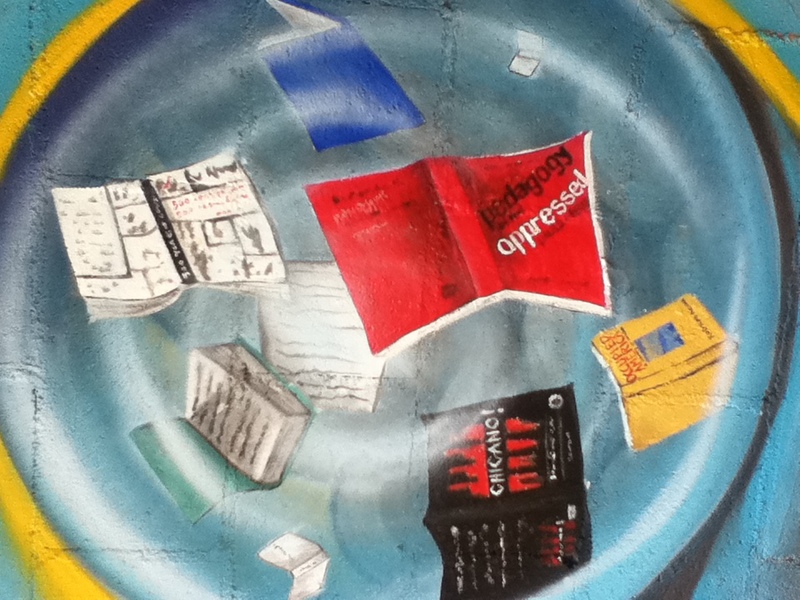 The cover of 500 Years of Chicano History is one of many banned books trapped in the crystal ball. Artist John Garcia was born and raised Los Angeles, in the East Hollywood Area. As a youth, he started out as college-bound catholic school kid. He began to experience identity and family issues, and at age 17, he was drawn to the streets and the gangs, drugs, and violence that go along with it. He joined the Army at age 20 as part of a plea bargain to escape serious criminal charges. He was honorably discharged, and used GI Bill to attend nursing school. John currently works full-time as a nurse with handicapped people. John became interested in art in 2008 and now it has become his life. The purpose of his art, is to create art that leads to thought which leads to culture. His goal is to connect to the creative forces of the cosmos and become a part of art history. You can like John Garcia on Facebook by clicking here. 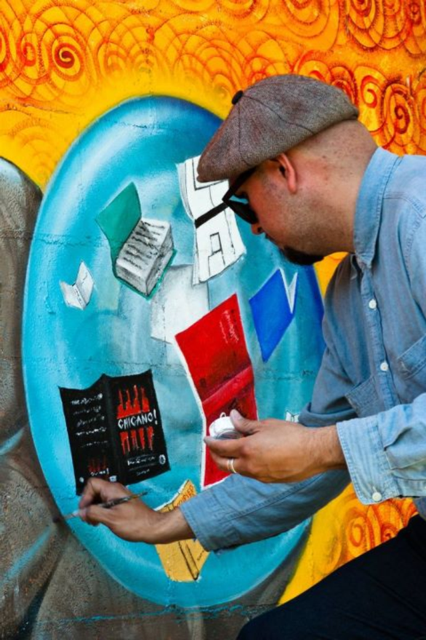 John Carlos De Luna was born and raised in Boyle Heights California, John Carlos De Luna, absorbed the vivid influences of L.A.’s best muralists and graffiti artists. 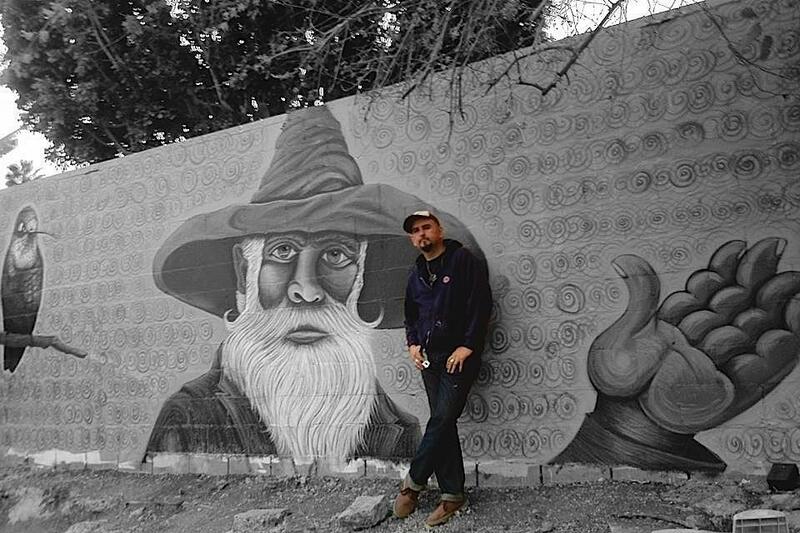 De Luna grew up in Los Angeles and was very active in the East Los Angeles Graffiti Art scene since the mid 1990’s, as a skillful and well-respected street artist. De Luna spent the majority of his youth in the infamous Estrada Courts Housing Projects, known for their historic murals. There he had the opportunity to admire, study and recreate these powerful works in his sketchbooks as a young child and teen, drawing from the inspiration of the legendary Chicano artists and muralists of the 1970′s. Most importantly the Chicano school of art, particularly “ASCO” as it stands as a defining factor in his art and continues to influence and penetrate his work. As De Luna has matured his work has become a powerful and enigmatic language, cultivating dialogues and creating social awareness around issues that affect all Americans and immigrants. De Luna still lives and works in his home studio in Boyle Heights Ca. For more info on John Carlos, click here or here. Wonderful post for wonderful art making very important statements.